Yosemite National Park is home to over 1,300 miles of rivers and creeks, as well as 300 lakes and ponds. With so many fly fishing opportunities at hand, we've design our fly fishing options page to give anglers a heads up on areas that they can choose to include in their private fly fishing package. ​Click the above link to find out more. These Fly Fishing Packages were designed for every angler that wants to make sure they catch every fly fishing opportunity Yosemite National Park has to offer. 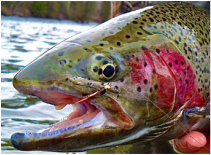 Your private, fly fishing guide will take you to the best rivers, creeks and lakes inside Yosemite and they will make sure that you have the upper hand on all the local fly fishing knowledge. With over 1,300 miles of rivers and creeks and more than 300 lakes and ponds to tempt your flies, Yosemite provides amazing opportunities for all experience levels. With our once-in-a-life-time tours, you will shred the guessing game of fly fishing in Yosemite and maybe even add a beautiful and rare California Golden to your list of trophy trout. We've constructed two different Fly Fishing Packages for our guests to choose from. Our Yosemite Fly Fishing Coordinators have designed our five and seven day tours to make sure that all of Yosemite's main bodies of water and majestic locations are incorporated. Once you decide on how many days to spend in Yosemite, head over to our "Tour Details" section to learn more about our three "Custom Package" options. If five or seven days is to long for your group, please contact our adventure coordinators to inquire about a 'Custom Tour Quote" and we will create an Inclusive Tour designed to meet your personal wants and needs. We've teamed up with mountain lodges, modern hotels and private custom home rental providers in order to offer our guests three unique and wonderful vacation packages. Let our adventure coordinators know how many people there will be and they will send over three distinct quotes that allow guests to pick between our entry level package, intermediate level package and all inclusive package. Our* Yosemite Falls Package * gives our guests the opportunity to stay in their own private custom home or cabin located in a small California Gold Rush town. These homes are part of a quite mountain neighborhood and they are located near a private mountain lake. This package is good for larger groups or families because each custom home provides 3 to 5 bedrooms, a full service kitchen and laundry facilities are located on property. Our* El Capitan Package* is hosted with the partnership of an updated lodge that has its own swimming pool and spa, newly renovated modern rooms, LCD Tv's and easy highway access to Yosemite. This lodge is located in the small town of Buck Meadows, CA and it is great for groups that are looking to lodge just 12 miles from the entrance of the park. Our* John Muir Package * is provided with the partnership of an updated mountain resort that is located on beautiful wooded land bordering Yosemite National Park. This first class lodging establishment hosts a game room, zip lines, salt water pool and an on site restaurant and bar. This is one of the highest rated lodging establishments in the Yosemite area. ﻿Refer to our ﻿"Packing Check List" ﻿if you need help with what to pack. Your Yosemite Adventure awaits! Pick your desired package and rest assured that you will have an adventure of a life time awaiting your arrival in Yosemite National Park. Our ﻿>FLY FISHING OPTIONS<﻿ link, that is located above, is for guests that want to customize their fly fishing packages even more. Your private guide will pick you up at 8:00am at a pre-determined location in San Francisco, CA, Fresno, CA or Sacramento, CA. (If included in your desired package) Yosemite will be reached by early afternoon and this is when the real adventure begins. Your afternoon will consist of fly fishing on the mighty Merced River in the valley. Large native Rainbow trout and wild Brown trout await your fly in every section of this amazing river. Your guide will drop you off at your lodging establishment for dinner around 6:00pm, depending on traffic and unforeseen circumstances. Your guide will pick you up at 8:00am; this will allow time for breakfast to be enjoyed from 7:00am to 7:45am. Day Two's journey will take you up into the high country of Yosemite National Park to chase wild Brook trout and Golden trout on peaceful mountain rivers and crystal clear, sub alpine lakes. When it's time for lunch, we will find a beautiful, serene place to relax and enjoy a backpacker's lunch. Your days journey will continue after lunch and until it's time to head back to your lodging establishment to get ready for dinner. Drop off time will be around 6:00pm depending on traffic and unforeseen circumstances. Your guide will pick you up at 8:00am; this will allow time for breakfast to be enjoyed from 7:00am to 7:45am. Day three’s adventure will take you to the southern end of Yosemite to try and catch aggressive Brown’s and Rainbow’s on tight mountain creeks and beautiful feeder rivers. When it’s time for lunch, your guide will find a quiet, scenic place to relax and enjoy your backpacker’s lunch. Your southern fly fishing adventure will continue after lunch and until it’s time to head back to your lodge for dinner. Drop off time will be around 6:00pm depending on traffic and unforeseen circumstances. Your guide will pick you up at 8:00am; this will allow time for breakfast to be enjoyed from 7:00am to 7:45am. Day Four's journey will take you into the canyon section of the mighty Merced River in pursuit of large, trophy trout. When it’s time for lunch, you will head into Yosemite Valley to enjoy one of their eateries. Your canyon fly fishing journey will continue after lunch and until it’s time to head back to your lodge for dinner. Drop off time will be around 6:00pm depending on traffic and unforeseen circumstances. Your guide will pick you up at 8:00am; this will allow time for breakfast to be enjoyed from 7:00am to 7:45am. Day Five's exploration will take you to the tail end of the Tuolumne River in Yosemite. This is where your fly fishing adventure in Yosemite will come to an end, but not before allowing for one last chance to catch a large, wild Yosemite Rainbow trout or Brown trout before heading back to your pre-determined drop off location in San Francisco, CA, Fresno, CA or Sacramento, CA. Your guide will stop at an old Gold Rush town for a step-back-in-time lunch and when you are finished, you'll hit the road to continue heading West to your desired location. (If included in your desired package) Drop off time will be around 6:00pm depending on traffic and unforeseen circumstances. Your guide will pick you up at 8:00am; this will allow time for breakfast to be enjoyed from 7:00am to 7:45am. Day four’s escapades will take you to the eastern side of Yosemite to try and catch high country Brook, Brown and Golden trout on beautiful sub-alpine lakes and rivers. When it’s time for lunch, you will head to a BBQ eatery in Yosemite’s high country for burgers, fries and ice cream. Your southern fly fishing adventure will continue after lunch and until it’s time to head back to your lodge for dinner. Drop off time will be around 6:00pm depending on traffic and unforeseen circumstances. Your guide will pick you up at 8:00am; this will allow time for breakfast to be enjoyed from 7:00am to 7:45am. Day five’s adventure will take you to the western side of Yosemite to chase hungry Rainbows and Browns on action packed rivers and creeks. When it’s time for lunch, your guide will find a quiet, scenic place to relax and enjoy your backpacker’s lunch. Your western fly fishing adventure will continue after lunch and until it’s time to head back to your lodge for dinner. Drop off time will be around 6:00pm depending on traffic and unforeseen circumstances. Your guide will pick you up at 8:00am; this will allow time for breakfast to be enjoyed from 7:00am to 7:45am. Day Six's journey will take you into the canyon section of the mighty Merced River in pursuit of large, trophy trout. When it’s time for lunch, you will head into Yosemite Valley to enjoy one of their eateries. Your canyon fly fishing journey will continue after lunch and until it’s time to head back to your lodge for dinner. Drop off time will be around 6:00pm depending on traffic and unforeseen circumstances. Your guide will pick you up at 8:00am; this will allow time for breakfast to be enjoyed from 7:00am to 7:45am. Day Seven's exploration will take you to the tail end of the Tuolumne River in Yosemite. This is where your fly fishing adventure in Yosemite will come to an end, but not before allowing for one last chance to catch a large, wild Yosemite Rainbow trout or Brown trout before heading back to your pre-determined drop off location in San Francisco, CA, Fresno, CA or Sacramento, CA. Your guide will stop at an old Gold Rush town for a step-back-in-time lunch and when you are finished, you'll hit the road to continue heading West to your desired location. (If included in your desired package) Drop off time will be around 6:00pm depending on traffic and unforeseen circumstances. Please contact one of our fly fishing coordinators for more details or to receive your custom tour quotes. You can also obtain a custom quote by filling out our online reservation request form.